Put the flour, cocoa, baking soda, salt, sugar, and coffee into the bowl of an electric mixer fitted with a paddle. Combine these ingredients on a medium-low speed and then toss in the nuts and chocolate chips. In a separate bowl, lightly whisk together the eggs and vanilla extract. Remove the bowl from the mixer and mix in any remaining dry ingredients from the bottom by hand. Prepare yourself: it’s super sticky. Bake the logs at 325°F for 30 to 35 minutes, switching the two pans top to bottom and back to front halfway through, until the sides are firm, the tops are cracked and the dough inside no longer looks wet. Remove the baking sheets from the oven and reduce the temperature to 300°F. Let the logs cool on the baking sheet for at least 10 minutes before slicing them on a slight diagonal into 1/4-inch slices. The longer they cool, the easier they are to slice. 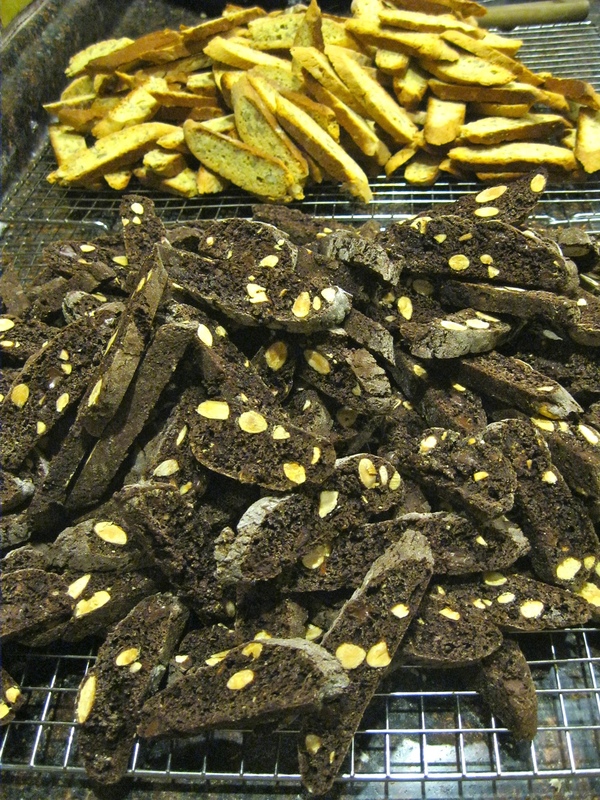 Place the biscotti flat on the baking sheet and dry them in the oven for about 20 minutes (depending on how thin they are), until the biscotti offer resistance when pressed but are not hard.